I have enjoyed a long artistic career in the field of graphic design, but I always had passion for textile. Finally, I found a medium in which I could truly express myself the same way I was able to do in graphic art. Felting is an ancient technique which allows unique freedom in the creative process. Similar to painting with oil on canvas, I paint with wool on silk, also adding hand-painted pieces of fabric of all sorts as embellishments. 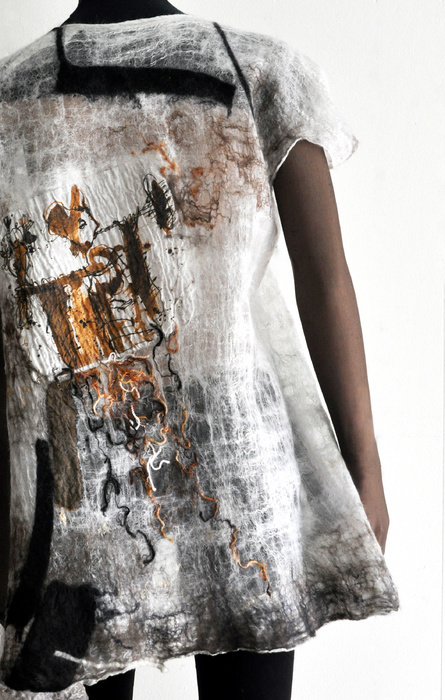 I finish the process by sculpting the garment with my bare hands, organically bringing all elements together. I love the beauty and happiness that my art pieces bring to people and me.